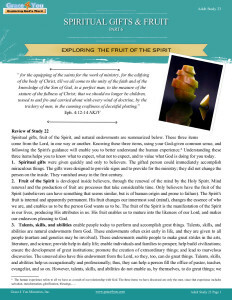 Study 23: Spiritual Gifts & Fruit – Exploring the Fruit of the Spirit | Grace 4 You Ministries, Inc. This study will delve into the fruit of the Spirit in detail. We will discuss how the fruit of the Spirit develops in the believer’s life through the renewal of the believer’s mind (transformation). Our resources in the renewal process are discussed, as are the results of a failure to thrive in the Christian life. Failure to thrive can lead to the diminishment of the Spirit’s fruitful actions, and this is not something any of us wants. The Holy Spirit is fruitful as He works in our lives; however, His fruit does not grow or mature quickly. His fruit is the result of His transforming action in our lives. Transformation of the mind is a process that occurs over time as we walk with the Lord. In this process, we must ensure we augment fruit growth, that is, we must do all that is necessary for the Spirit to work in our lives. By way of analogy, the development of the fruit of the Spirit seems to follow the growth of natural fruit. Thus, rain is required for natural fruit to develop into edible form. In the spiritual realm, rain is the equivalent of worship and study of the Word. In the following list, the factors that enhance natural fruit growth are shown, followed by the corresponding factors (in parentheses) that encourage growth of spiritual fruit in our lives. Discuss: What are some other things required for natural fruit development, and what would be the spiritual counterpart in our lives? The production of fruit in our lives depends upon our consistent and determined yielding to the Spirit. Yielding could also be called following Him or walking in the Spirit; all the result of obeying the Word. Through the Word, we can know what He is doing or desires from us. As we adhere to the Word, we will not be quenching His actions, as though putting out a fire by dousing it in water (1 Thes. 5:19). Instead, we will be allowing Him to have a productive influence, thereby producing the fruit of the Spirit in our lives. The fruit of the Spirit is the outgrowth (result) of His presence and work in our lives, transforming us. Transformation requires feeding on the Word, the primary means by which the Lord can speak to us so we know His will, and our part in the transformation process. The Lord gives us resources to help in the transformation process. Since we are in a spiritual warfare, these resources are often considered weapons. These weapons are spiritual and of a soulish nature (from our soul), far different than any other weapon. The spiritual-soulish weapons the Lord gives us are truly unique. They are used against the worst enemy we will ever face, our own non-regenerated mind, that is, our old selves. Salvation changes us spiritually, but now our soul/mind has to be changed. The Holy Spirit works to renew our minds, but there is a continuing struggle with our old minds and Satan. Six of our weapons are listed below. Certainly there are more and your study of the Word will allow the Spirit to bring them to your attention. These weapons are called “mighty in God,” which means they are very powerful because He ordained them and works through them for our benefit. The Scripture reads, “For the weapons of our warfare are not carnal but mighty in God for pulling down strongholds, casting down arguments and every high thing that exalts itself against the knowledge of God, bringing every thought into captivity to the obedience of Christ, and being ready to punish all disobedience when your obedience is fulfilled” (2 Cor. 10:4-6). While the following list is not exhaustive, it does reveal typical resources that are ours in the transformation process. · Weapon 1: Know sin. You have to recognize if something in your life is a sin. Recognizing sin will require a close and intimate connection with Christ. Something may be a sin if it: violates God’s clear commands, weakens your relationship with Him, controls your mind, harms your family, damages your health…. Sometimes it is difficult to know what is sinful, but you know you cannot fool Him. You can fool yourself by allowing sinful behavior to have safe harbor in your soul. A sin can be something you do not want to give up, have long ago forgotten is a sin, something you excuse for convenience, and so on. You must be honest with Him and yourself. Something as simple as overeating may become a sin when it results in disease or the inability to carry on a normal life. Recognize sin, then confess it to the Lord, that is, acknowledge it is a sin. If you are saved, you are already forgiven for this sin; God does not hold our sins against us until we ask for forgiveness (all our sins, including our future sins, are forgiven when we were saved). As a note of clarification, 1 John 1:9 refers to the unsaved; it is not saying Christians must confess their sins in order to be forgiven. However, acknowledging the sin (even though forgiven) makes it clear in your mind it is wrong, and it enhances your relationship with Him. Once you have acknowledged your failures, it will make you want to follow the Forgiver’s directions in Romans 12. · Weapon 2: Break down strongholds in your mind (2 Cor. 10:4). Strongholds are the former (characteristic of the old you) thought patterns, values, altitudes, and obsessions. These are wrong ways that have been implanted in your mind and that control your life and thoughts. Too often the past strongholds come back to recapture our minds and lead them captive again. · Weapon 3: Bring every thought and purpose into captivity to the obedience of Christ (2 Cor. 10:5). This verse is referring to a willingness to allow the Lord to capture every thought and purpose in your life and change it. This will take determination on your part to allow that change to take place. · Weapon 4: Have a readiness to avenge/change behavior (Phil. 3:16). We will reach a level of spiritual maturity, and we are expected to live accordingly. If we do not live according to what He has taught us, He will create within us a desire to avenge or change any behavior to make it conform to His will. · Weapon 5: Make no provisions for the flesh (Rom. 13:14). We are commanded not to make preparations to satisfy our personal cravings, which satisfy the lusts of the flesh. This is so simple to understand but so hard to do. For example, a person with an alcohol addiction cannot have alcohol hidden in a secret place just in case of a strong craving. Make no provision means not to allow the provision to be accessible for use during a time of weakness. If you cannot get to the provision (because you made it unavailable), then you may be able to pass the hour of temptation successfully. · Weapon 6: Forget the past (Phil. 3:13). This verse is not suggesting you can forget everything in your past. It will be a terrible struggle but you must not allow yourself to think about any past event that causes you emotional upheaval, whether the event was true or not, whether the event was good or bad. If you were treated wrongly as a child, whoever did it was wrong. However, that person can still control you as an adult if you think about the past and get upset. You will have to put past events behind you and move on. You cannot allow yourself to think of them for one second. The moment the thought of hurtful past events comes into your mind you have to be prepared to change the thought. Eventually, as you are transformed, that event will still remain in your memory, but that memory will not elicit an emotional response nor will it control your life any longer. You will be able to recall the event without the emotional reaction; it will be just a memory, not the present day reliving of the pain and sorrow. These tools (and others in the Scripture) are effective in allowing the Holy Spirit to be fruitful in our lives. To think God has not given us the required resources to attain what He asks and to succeed triumphantly would be inappropriate. As the fruit of the Spirit become part of our lives, we will demonstrate Christ-likeness to those around us.